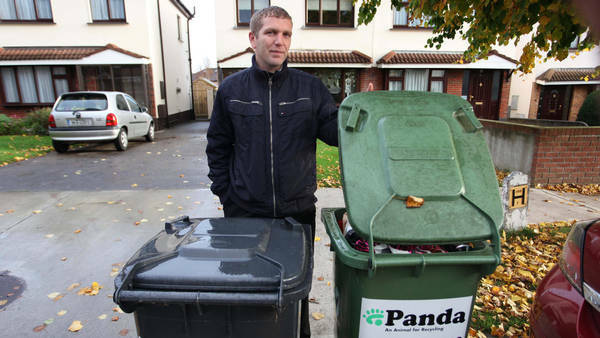 Environmental Taxes in Ireland: Taxes on garbage and fossil fuels are part of Ireland’s novel strategy to shrink its debt. DUBLIN — Over the last three years, with its economy in tatters, Ireland embraced a novel strategy to help reduce its staggering deficit: charging households and businesses for the environmental damage they cause. “I think most economists — on the right and the left — think a carbon tax is a good idea,” said Aparna Mathur, a resident scholar at the American Enterprise Institute, a conservative research group that held a daylong seminar on carbon taxes in November. Some economists estimate that a carbon tax could raise $400 billion annually in the United States, she said. But the issue remains a nonstarter in the American political arena. even though Gilbert Metcalf, the Obama administration’s deputy assistant Treasury secretary for environment and energy, long promoted carbon taxes as a Tufts University economist. The Competitive Enterprise Institute, a conservative advocacy group, has even filed a Freedom of Information suit seeking the release of Treasury Department e-mails containing the word “carbon” to make sure that nothing is in the works. Like many other economists, Dr. Metcalf has argued that carbon taxation is preferable to government regulation or cap-and-trade systems because it sets a straightforward price on greenhouse gas emissions and is relatively hard to evade. Although carbon taxes in some ways disproportionately affect the poor — who are less able to buy new, more efficient cars, for example — such taxes do heavily penalize the wealthy, who consume far more. As with “sin taxes” on cigarettes, the taxes also alleviate some of the societal costs of pollution. Ireland took the plunge after its economy collapsed in 2008 as a result of loose credit policies that created a real estate bubble; in one year, tax revenues fell 25 percent. With a huge bailout in 2010 by the European Union and the International Monetary Fund, Ireland’s deficit soared to 11.9 percent of its gross domestic product, or over 30 percent with all loans factored in. The environmental taxes work in concert with austerity measures like reduced welfare payments and higher fees for health care that are expected to save 2.2 billion euros this year. The carbon tax is levied on fossil fuels when they enter the country and is then passed on to consumers at the point of purchase. The automobile sales tax, which ranges from 14 to 36 percent of a car’s market price depending on its emissions, is simply folded into the sticker price. Of course, new environmental taxes bring new pain. Gas, always expensive in Europe, sells here for about $8 a gallon, around 20 percent more than in 2009 because of tightening market supplies and the new tax. We do not need environmental and health experts to remind us that the quality of the air we breathe has a direct impact on public heath. For a small but populous city like Hong Kong, the importance of clean air cannot be overstated. Over the years, the public has been repeatedly assured by successive governments that officials are sparing no efforts in fighting air pollution. Despite research and reforms, however, our air quality still leaves a lot to be desired. It remains to be seen whether the recent remarks made by the new team represent a breath of fresh air in the city’s strategy to combat pollution. In response to the Audit Commission’s criticism that air quality objectives have never been fully achieved over the past 25 years, deputy environment chief Christine Loh Kung-wai said previous governments had been too passive in updating the standards. But the new government was confident of achieving more stringent targets, which will be in place by 2014, she said. Whether the problems have been given due attention and priority in the past is open to debate. Arguably, there is always room to do more. With the benefit of hindsight, many would probably agree that a lot more could have been done. It is hardly surprising to see incumbents attributing policy failures of their predecessors to a lack of political will. But when they criticise and vow to do better, public expectations are also raised accordingly. Failing to deliver will open themselves to similar attack in due course. It takes more than rhetoric to convince the people that clean air is not an elusive goal. That Chief Executive Leung Chun-ying is to deliver a comprehensive strategy in his policy address next month should be welcome news. Loh rightly pointed out that a more holistic approach is needed to reduce air pollution. Phasing out polluting diesel vehicles and upgrading the bus fleet are not enough. Elsewhere, strategies such as electronic road pricing have long been proved an effective tool to ease congestion and reduce road emissions. Loh seems to share the view, though she would not be drawn on whether the measure, first raised in 1982 but shelved because of a lack of consensus, would be back on the agenda. The job of cleaning up the air falls squarely on Leung’s shoulders now. He needs to demonstrate stronger political will and, above all, the ability to deliver. Clear the Air says: This is what they need in Central, Causeway Bay and Mongkok with only hybrid , electric or Euro VI buses plying the busy routes like Nathan Road and other designated Clean Air Zones. Only then will we start to see lower roadside pollution in those areas. The first working day at the new bus transit station in Tuen Mun went off smoothly – although a few passengers did board the wrong vehicle. The Siu Lam station was officially opened on Boxing Day and most of the passengers then were enjoying a holiday. “The bus transit is still at a preliminary stage and the Transport Department will decide whether to remove some of the routes after getting feedback,” said acting transport commissioner Caroline Yip Lai-ching, adding that more than 100 passengers used the facility yesterday. Kowloon Motor Bus deputy managing director Evan Auyang said commuters generally found the service more convenient than the MTR. However, some passengers said they were confused and want better signs to direct them to the correct buses. For instance, KMB Route 61M, which originally went to Lai King, now uses the facility as the final stop. This confused some passengers who wondered how they could reach their destinations. Another bus transit towards Tuen Mun town is under construction and is expected to open in the second half of next year. Mainland environmental officials must have breathed an ironic sigh of relief this month when some of the worst air pollution readings of the year in most cities went largely unnoticed, barely prompting any public discussion. Unlike the nationwide outcry over worsening smog problems a year ago, most mainlanders appear to have had their eyes glued to the palace intrigues and power struggles exposed in the months leading up to the Communist Party’s generational leadership transition last month. Even more worryingly from an environmental perspective, some deeply troubling recent revelations about the risks of breathing the dirty air in mainland cities attracted little attention from the media or the public. The study by mainland scientists offered some clues about just how dangerous it is to live in areas with too much air pollution. Nearly 2,600 people were expected to die prematurely in Beijing this year due to pollution from smog-causing fine particles, known as PM2.5, while the death toll in Shanghai was expected to top 3,300. It was the first time that mainland pollution experts had singled out PM2.5 – microscopic airborne particles less than 2.5 microns in diameter – from among dozens of health-threatening pollutants. The World Health Organisation says PM2.5, roughly a 28th of the diameter of a human hair, poses a far more serious health hazard than bigger particles such as PM10 – with a diameter of 10 microns – and many other pollutants because fine particles can be absorbed deep into the bloodstream and cause lung cancer and other deadly diseases. Although the study, jointly released last week by Peking University’s school of public health and Greenpeace East Asia, has shed some much needed light on a vitally important public health issue, it is worth noting that it is far from comprehensive enough to paint a full picture of the health risks posed by PM2.5 pollution. Air pollution expert Pan Xiaochuan said the scope and accuracy of the study had been significantly restricted due to a lack of adequate data – access to which is tightly controlled by the government. “We have long been prepared for this kind of study, but we simply don’t have access to sufficient and credible data, which is the single most important reason that we lag behind many other countries in finding out the links between air pollution and public health,” Pan said. He and Greenpeace campaigner Zhou Rong , who both helped draft the report, were candid about the limitations of the study, which did not include statistics about deadly, chronic diseases caused by long-term exposure to PM2.5, or those about the accumulated health costs. It remains unclear if those statistics are readily available at all, with many experts saying the mainland authorities have yet to approve any studies of the long-term health effects of living with poor air quality. But why is that? Are mainland leaders unaware of the danger of air pollution? That’s certainly not the case, with top leaders inside the secretive Zhongnanhai compound in central Beijing turning on air purifiers to cope with smog problems just days after the 2008 Olympics. 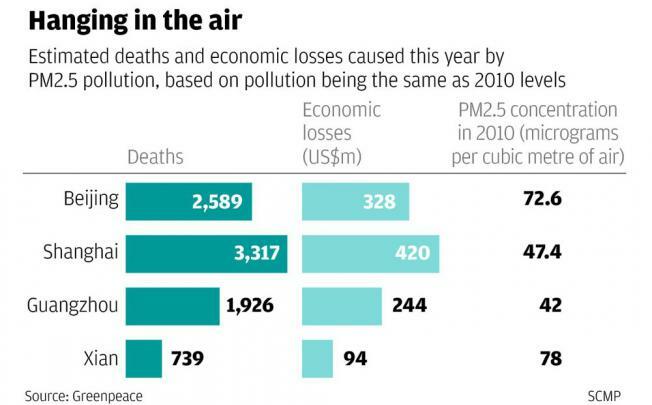 And it is no secret that air pollution kills people. Citing a World Bank report, Achim Steiner, former head of the UN Environment Programme, said during the Beijing Olympics that there were more than 200,000 premature deaths on the mainland each year as a result of air pollution, with the cost of pollution estimated at US$100 billion a year. Some experts said the mainland authorities had suppressed the World Bank report. Although Beijing has included PM2.5 in pollution parameters and allowed limited access to real-time PM2.5 monitoring data after coming under public pressure, it still lacks the sincerity to face the bleak reality and continues to play hide and seek on this issue. Several mainland experts complain that the authorities have grown more sensitive about air pollution studies. The government used to tolerate some pilot research projects. One, unveiled in 2006, found that about 358,000 residents of 600 mainland cities died prematurely in 2004 from breathing polluted air, with an estimated health cost of 152.7 billion yuan. Another leading pollution scientist, who asked not to be named, said the government, including the environment ministry, now “simply refuse to do any research regarding the health effects of air pollution”. WASHINGTON – Today, the U.S. Environmental Protection Agency (EPA) finalized changes to Clean Air Act standards for boilers and certain incinerators that will achieve extensive public health protections by slashing toxic air pollution, including mercury and particle pollution, while at the same addressing feedback provided by industry and labor groups, increasing the rule’s flexibility and dramatically reducing costs. As a result, 99 percent of the approximately 1.5 million boilers in the U.S. are not covered or can meet the new standards by conducting periodic maintenance or regular tune-ups. The final adjustments to the standards are based on an extensive analysis of data and input from states, environmental groups, industry, lawmakers and the public. As a result of information gathered through this review, including significant dialogue and meetings with public health groups, industry, and the public, the final rule dramatically cuts the cost of implementation by individual boilers that EPA proposed in 2010. At the same time, these rules will continue to deliver significant public health benefits. EPA estimates that for every dollar spent to reduce these pollutants, the public will see $13 to $29 in health benefits, including fewer instances of asthma, heart attacks, as well as premature deaths. Today’s rules set numerical emission limits for less than one percent of boilers – those that emit the majority of pollution from this sector. For these high emitting boilers and incinerators, typically operating at refineries, chemical plants and other industrial facilities, EPA is establishing more targeted emissions limits that protect public health and provide industry with practical, cost-effective options to meet the standards. EPA has also finalized revisions to the Non-Hazardous Secondary Materials Rule to provide clarity on what types of secondary materials are considered non-waste fuels and provide greater flexibility in rule implementation. This final rule classifies a number of secondary materials as categorical non-wastes when used as a fuel and allows for operators to request that EPA identify specific materials through rulemaking as a categorical non-waste fuel. The Hong Kong government has raised concerns about air pollution with the World Health Organization in Geneva. Chan — who served as the territory’s director of health before joining the WHO — did not identify the official, but told an Asia Society lunch that they had discussed what could be done to improve local air quality, RTHK reports. The health risks of microscopic air pollutants have been grossly underestimated on the mainland, with nearly 8,600 premature deaths expected this year in four major cities, a study has revealed. And premature deaths are “just a tiny fraction” of the adverse health impacts of tiny airborne particles, less than 2.5 microns in diameter, known as fine particle matter 2.5 (PM2.5). The startling findings were included in a report by Greenpeace East Asia and Peking University’s school of public health which, for the first time, focused on PM2.5 health hazards in urban areas. Environmentalists have hailed the study, released yesterday, as ground-breaking, with data linking poor air quality to deadly diseases. Noting that the World Bank once put the number of premature deaths on the mainland as a result of air pollution at more than 200,000, Professor Pan Xiaochuan, of Peking University, said the study focused on a single pollutant and had not taken into account the long-term health impact of PM2.5, which could be far more dangerous. The study’s estimation of combined economic losses caused by premature deaths, put at 6.8 billion yuan (HK$8.34 billion), was also likely to be far lower than the real figure owing to limited access to official statistics, he added. Fine particles have long been known to pose greater health risks than more than a dozen other air pollutants. They damage lung tissue and the cardiovascular system, cause lung cancer and other deadly diseases, and lead to a higher mortality rate. Based on official mortality figures in 2010 and limited PM2.5 monitoring data in Beijing, Shanghai, Guangzhou and Xian, mostly from environment-related research institutes, the study showed a more than 10 per cent rise in premature deaths caused by PM2.5 pollution in the four cities over the past two years. More than two-thirds of the 8,572 premature deaths this year caused by the microscopic pollutant occurred in Beijing and Shanghai. Although Beijing’s air pollution problem was worse, Shanghai saw the most deaths linked to PM2.5 – 3,317. Pan said the study, which used internationally accepted mathematical methods, closely resembled the trends found in many other countries. “People living in less polluted areas appear to be more sensitive to poor air quality and more prone to pollution-induced diseases,” he said yesterday. Pan and Greenpeace campaigner Zhou Rong, both of whom helped draft the report, said their estimated death tolls may be far lower than the real figures because of a lack of transparency on air pollution and health data. “We’ve tried to find more pollution readings and statistics about deadly, chronic diseases caused by long-term exposure to PM2.5, but we have made little progress,” Zhou said. Previous research, partly sponsored by the government and released in 2006, showed that about 358,000 residents in 600 mainland cities died prematurely in 2004 from breathing polluted air, with an estimated health cost of 152.7 billion yuan. Although the central government has included PM2.5 in pollution parameters and unveiled a timetable for the mandatory release of PM2.5 monitoring data, Zhou said it was too little, too late. The report said premature deaths would be cut by at least 81 per cent and economic losses at the four cities alone could be reduced by 5.5 billion yuan if stricter World Health Organisation standards were adopted.